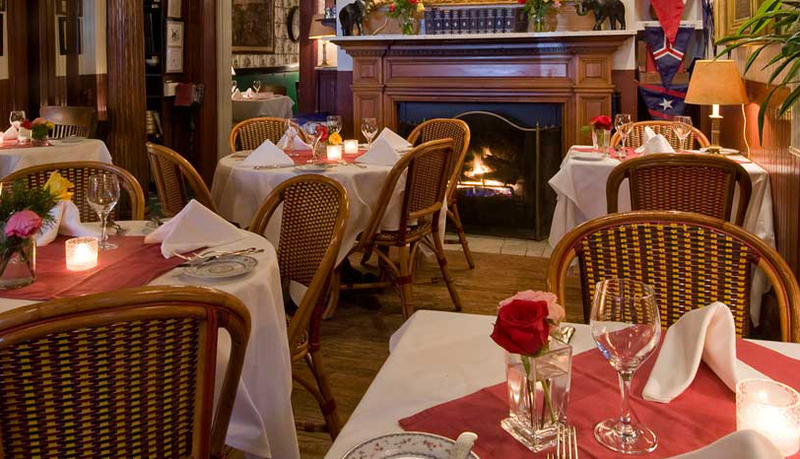 Our Main Dining Room is available for parties of up-to about eighty people. The Drew Room is a more intimate, quieter space favored by many of our regular clients. An Atrium or “The Alley” is a cheerful glass covered area with palms and ficus and ivy. The bar and lobby tables are always in demand; it’s noisy and fun and most dynamic. The Front Porch is open in favorable weather to let diners take in the lively Sag Harbor scene. Fresh local foods, our great seafood, exquisite shellfish, peerless meats and fowl are prepared in classically-grounded, time-tested preparations by our veteran staff. Don’t expect nouvelle concepts, but rather, unparalleled filet and sirloin, foie gras, oysters, caviar, lobster, Long Island duckling, a number of daily fish specials and much more. We always try distinguish our menu with dishes such as sweetbreads or calves liver, the delicious Peconic Bay scallops, partridge or pheasant. Master menus change periodically and daily items and their preparations are always changing. Review a typical menu on-line, and give us a call! Reserve for breakfast, lunch or dinner every day of the week, every day of the year. The American Hotel features an award-winning, inventive, “American-French” cuisine all its own and is led by the exceptional talents of Executive Chef Jonathan Parker. The menus feature creative dishes grounded in the French classical tradition. The menus feature creative dishes that bring the enticing flavors of France, Italy, America and Asia to the table. The menus change with the seasons and are always an eclectic blend of local and imported produce. The American Hotel restaurant offers one of the most extensive menus in the Hamptons, appealing to all appetites and tastes. At The American Hotel, we take pride in offering our guests access to one of the most extensive wine cellars in the world. The Hotel is annually recognized by the Wine Spectator in receiving their highest award, the “Grand Award for One of the Greatest Wine lists in the World” — one of only 87 restaurants worldwide. The Hotel has been awarded this award for the past twenty years, since its inception in 1981. Only nine restaurants in New York State hold this prestigious award and the Hotel is the only one on the whole of Long Island. Learn more about our wine list here.